Graeme Dobell’s contributions are always entertaining and frequently insightful, which makes it forgivable if now and again his arguments are well wide of the mark. We had one such moment with his piece reflecting on the decision to go to war in Iraq in 2003 , where he slams the public service for its passivity and silence in failing to oppose the war and indeed doing ‘… a worse job of confronting the issues than did their predecessors during the lousy processes that sent Australia off to Vietnam’. That’s a remarkably harsh judgement, and one informed with the benefit of hindsight unavailable to the original decision makers or their advisers. It overstates what might reasonably be expected of public servants in advising Cabinet and undersells the deliberations that actually took place. I’m sure it was the case that some senior public servants opposed going to war—as did a fair chunk of the population—but many in the national security community would also have backed the decision. There was no gulf of silence between the bureaucracy and Government, but more a shared acceptance of the dimension of the problem and the likely end point. It might be correct to say that there was no specific cabinet paper arguing the pros and cons of involvement in the Iraq war, but there was a very substantial flow of reporting to government: intelligence judgements on Saddam’s weapons of mass destruction programs; diplomatic reporting about efforts to get Iraq to be more transparent on its weapons plans and on manoeuvres at the UN; military reporting on US and allied preparations and on the likely opposition. These were the issues around which there was intense public debate and public service policy work. 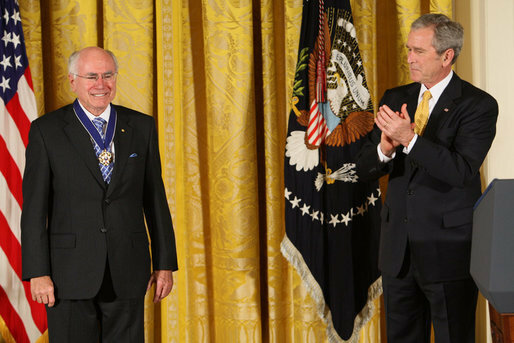 In his autobiography, Lazarus Rising, John Howard acknowledges a failure on the part of the occupying powers not to think through the military requirements of the post-invasion phase. That was clearly a profound mistake, but hardly one on which Australia was alone. In 2003 most of the public opposition to the conflict centred around three things. First, whether all peaceful means had been exhausted to make Iraq compliant with international demands on WMD, second the level of UN Security Council support for the invasion, and third the likely nature of Iraqi military resistance. Simon Crean’s speech referred to by Graeme makes it clear that the Opposition accepted the view that Iraq was concealing WMD and indeed would have supported the commitment of Australian forces had a further UNSC resolution authorising the conflict been passed. This was a position structured around a preference for UN procedure, not opposition to war. It’s important also to remember that Australia’s involvement in the initial attack on Iraq was the involvement of a smaller ally. The chapter on Iraq in Howard’s autobiography actually presents a remarkably frank acknowledgement of that fact. He says that by the second half of 2002 he had concluded that the US would certainly take military action against Iraq. The decision Australia faced was about whether it was in our interests to participate in the conflict in support of the US. The value of the alliance relationship was a strong driver in Howard’s decision. Here it’s important to understand the broader context of America’s reactions to the 9/11 attacks and of the all-pervasive sense of worry about terrorism—the October 2002 Bali bombing where 88 Australians were killed was the backdrop to the Iraq debates of early 2003. My own view is that Australia didn’t have a realistic option to cut itself away from alliance loyalty to the US in 2003. Had we done so, the alliance relationship would have been in profound crisis. That realisation informed much of the national security community’s approach to the decision to deploy Australian forces. One point Graeme does acknowledge is that John Howard then and now did not shirk his personal responsibility for the decision to deploy forces. Howard said: ‘I had been the driving force behind the firm support we had given to the Americans. … Understandably I would then wear the blame’. In a Parliamentary system like ours that’s the only position a Prime Minister can take. It’s not the role of the PS to take a contrary position to government policy. That this didn’t happen in 2003 is something we should be grateful for in a democracy. Peter Jennings is executive director of the Australian Strategic Policy Institute. Image courtesy of Wikipedia .